Until September 1972, there was only one Magic Roundabout and it was a children's television programme featuring Dougal the dog, a hippy rabbit called Dylan and the spring-loaded Zebedee. 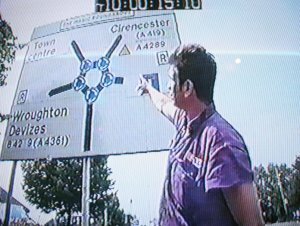 Then a revolutionary idea (in more ways than one) which had been tested in Colchester, Essex, was also tested on Swindon's County Ground Roundabout. Until then the area had been a motorist's nightmare which routinely failed to handle the volume of traffic which converged on it from five directions. The new roundabout (see picture above was the work of the Road Research Laboratory (RRL) and their solution was brilliantly simple. All they did was combine two roundabouts in one - the first the conventional, clockwise variety and the second, which revolved inside the first, sending traffic anti-clockwise. PC Steve Dudley, one of the police officers involved with the introduction of the new system, recalled: "There was someone from the RRL up on a crane and officers on each of the five junctions. We would let the traffic build up and then let one lot go at a time. After a few trial runs we let the whole lot go at once. It was quite nerve-racking, but it did work." 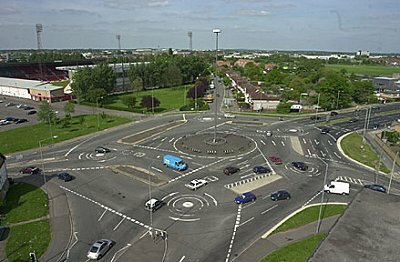 They called it a multi-mini roundabout, but as far as Swindon folk was concerned, they now had their very own Magic Roundabout. And magic it certainly is. Though it may confuse or amuse new visitors and baffle American tourists, the average Swindonian finds that his or her passage through one of the town's busiest junctions is actually quite fluid, even at peak times. 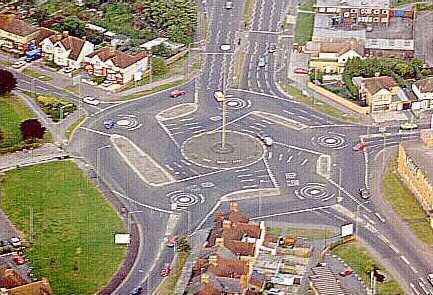 Twenty-five years on, the Magic Roundabout still works, despite ever-increasing volumes of traffic. Though there have been 14 serious accidents and just over a hundred lesser ones recorded in 25 years, that rate is less than one would expect for such a busy junction. Most accidents have involved cyclists and motorcyclists and now a cycle lane running right round the outside of the roundabout, with pelican crossings, should ensure that the Magic Roundabout becomes as safe as it is efficient. 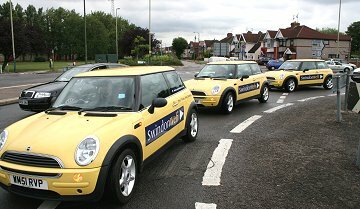 And we love to drive the SwindonWeb Minis around it! 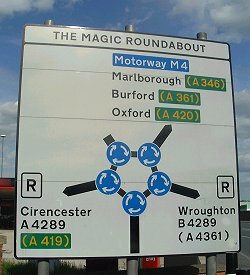 It has also inspired a pop song - English Roundabout by Swindon's world-famous band, XTC - and the only real controversy has been over its name. For years, stuffy Wiltshire County Councillors at Trowbridge insisted on calling it County Islands. 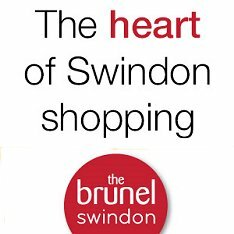 But Swindon folk recognised the magic when they saw it. featured one of our marvellous T-shirts!